Two rare goals from Alex Kenyon helped Morecambe to a first win in six League 2 home games on Saturday. The midfielder’s second and third goals for the club, both from Jamie Devitt corners, had put the hosts well in command. But a Conor Chaplin strike on 85 minutes set up an interesting finale with Padraig Amond’s stunning goal needed to settle any nerves as the game required 11 minutes of stoppage time after a serious head injury to Josh Passley. Morecambe made a bright start with Laurence Wilson and Paul Mullin bringing saves from Paul Jones inside the first five minutes. 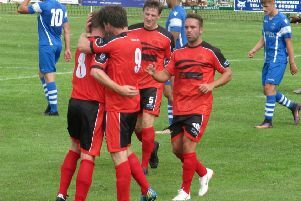 Despite a scare shortly after as Dan Butler’s corner was scrambled clear the Shrimps’ positive opening was rewarded on 10 minutes with the game’s first goal. Having threatened from earlier corners Kenyon rose highest to head home Jamie Devitt’s whipped centre at the near post for his second Shrimps goal. After a frantic start the game calmed with Morecambe well on top without really testing Jones despite some fine football. Several promising moves as the half progressed came to nothing before Portsmouth, with just two away wins to their name all season, had their best chance five minutes before the break. James Dunne drilled a long pass to Matt Tubbs on the right edge of the area who twisted and turned his way past Andy Parrish only to be denied by a fine save from Danny Ward low to his right. Morecambe were slow to start after the stoppage and were punished five minutes before the end of normal time. Portsmouth capitalised on a Kenyon error and countered with Chaplin firing home a left-foot shot from 15 yards. But the home fans didn’t need to worry, Amond lashing in an unstoppable shot from 18 yards to make sure of the points and just a second home win of 2015 on 92 minutes. Morecambe: Ward, Beeley, Edwards, Parrish (capt), Wilson, Kenyon, Fleming, Wildig (Wright 68), Devitt (McGowan 86), Amond, Mullin (Ellison 68). Subs not used: Arestidou, Drummond, Watson, Bondswell. Portsmouth: Jones, Passley (Webster 82), Nosworthy, Devera, Butler, Dunne, Atangana, Wallace, Fogden (Chaplin 57), Tubbs, Taylor (capt) (Westcarr 74). Subs not used: Cornell, Shorey, Hollands, Close.